RAPID CITY, SOUTH DAKOTA — An old pickup rattles to the top of a grassy ridge. The Black Hills stretch across the western horizon, and in the valley below, the family ranch of Marvin Kammerer is only a dot in the fields of grass. Kammerer stops the truck, gets out and looks down on his land. Behind him, a massive runway cuts across the prairie; a pair of B-1 bombers roars overhead. Kammerer grew up here, in the shadow of Ellsworth Air Force Base. His ranch abuts the end of the runway, and over the years he’s seen several plane crashes — the cause of 36 deaths — on or near his property. "Every time one of those B-1 bombers fly over, it’s a violation of my environment, not a protector of good," he says. "It’s just a symbol of what we can do to destroy." Kammerer, 67, has spent his life close to the land; he has mud caked on his boots, rough hands, and a face weathered by sun and wind. He often wears a worn-out hat, a vest over a thin plaid shirt, and a bandanna around his neck. He’s also spent much of his life working for social and environmental justice in the Black Hills of South Dakota. "I realized early that if you didn’t fight for what you believed, nobody else was going to do it for you," he says. "I found out that what I thought of myself was more important than what the neighbors thought of me." Kammerer says his beliefs stem from several influences, including his grandfather, who was a war resister in Germany during World War I. As a child, he watched his relatives and friends go off to World War II, and he witnessed the early victories of progressive programs like the rural electric cooperatives and the Soil Conservation Service. "I’ve raised seven kids, several horses, and some hell," he says. "I hope I’ve instilled a sense of responsibility in my children, so that if someday I have a grandkid on my lap and somehow the environment is all screwed up, I can at least say that I tried my best to not let it happen." In the late 1970s, Kammerer helped form the Black Hills Alliance, a core group of about 20 to 30 cowboys, Native Americans and activists who joined forces to stop uranium mining and depleted-uranium weapons-testing in the area. Through direct action, public-awareness campaigns, national coalition building, and mass protests, the group made uranium mining in the Black Hills a national issue. As mining companies pushed into the hills, activists exposed the negative impacts uranium mining could have on the people, environment and economy of the state. In 1984, the Alliance helped to pass a statewide initiative to block low-level radioactive waste dumping in the Black Hills. "It’s only through the efforts of grassroots people that the rules and regulations were brought about to keep the corporate empires in check," Kammerer says. In 1980, Kammerer helped organize the largest mass protest in South Dakota’s history. The Black Hills International Survival Gathering brought 12,000 people to camp on his property. The group built large rock symbols — a peace sign, a medicine wheel and an international symbol for the environment — that can still be seen from the air by the Air Force pilots as they take off and land. The Survival Gathering also called for an end to uranium exploration and the restoration of treaty claims of the Great Sioux Nation. The land of western South Dakota was promised to the Sioux Nation in the Fort Laramie treaty of 1868, a treaty later broken when the Lakota, Dakota and Nakota Sioux were confined to reservations. 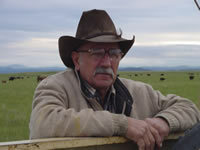 Kammerer’s grandfather homesteaded his ranch on Sioux land in 1898 1886. "We squatted on this land, and as far as I’m concerned we’re still squatting," says Kammerer. Kammerer’s stance on treaty rights and environmental justice has won him many friends in the Native American community, and helped overcome some of the long-standing racial divisions in the state. "He’s been kind of like a Lone Ranger," says JoAnn Tall, who was involved in the Black Hills Alliance in the late 1970s. "In South Dakota, we’re in a real prejudicial and racist state, and for Marv to come out back in the day, (in support of treaty rights), many non-natives were kind of taken aback. But now, some people have come around to his way of thinking." In the early 1990s, then-Gov. George Mickelson, a Republican, brought together natives and non-natives to talk through race issues, a process those on both sides say resulted in greater cross-cultural communication and understanding. But deep-rooted problems remain; in early 2000, a U.S. Civil Rights Commission study showed that Native Americans in South Dakota strongly believe there are racial disparities within the state justice system. For Kammerer, the treaty rights of the Sioux people are connected to modern efforts to preserve the environment — and, ironically, to the struggle to keep "squatters" like him on the land. "The cowboys are now suffering the same fate as the Indians," he says. "We’re being pushed off the land, and our way of life is dying." Kammerer and his wife have taken second jobs over the years to keep the family ranch, which he hopes to one day pass on to his children. As the sun sets over the Black Hills, Kammerer climbs back into his truck and drives toward his ranch house. The pickup bounces across the prairie, and a B-1 bomber touches down. "This is a lifelong struggle," he says. "You don’t make big waves. If you have any successes, they will be small ones. It’s like taking a stone and throwing it in the water." The author ([email protected]) is a journalist in Rapid City. He grew up in the Black Hills.